When someone is no longer able to stand in the shower for long, this chair will be a welcome relief. Simply roll them into the shower stall and lock the rear wheels. The padded seat provides more comfort than standard shower chairs and the open area allows for easier bathing. You can also roll the chair over a conventional toilet, which will save you transferring the person over and over. Go straight from the toilet to the shower with minimum effort. The large wheels roll smoothly over floors and carpets. The padded vinyl seat adds to comfort. The PVC backrest is waterproof. ARB Teak products are made from responsibly harvested grade A' teak - dried to perfection and beautifully finished. We use only the highest quality hardware made from solid brass and stainless steel, meaning no rust. Our Solid Teak Shower mat is ideal for "wet" applications and made to withstand constant water flow. These steps are made from responsibly harvested Grade-A teak - dried to perfection and beautifully finished. High quality brass and stainless steel hardware will not rust. This solid Teak Spa Step is ideal for wet applications and made to withstand constant water flow. Duck Brand Softex Bath Mats have a soft and comfortable skid-resistant surface for safer footing. The mat is held in place by suction cups and contains an antimicrobial agent that inhibits mold and mildew growth. Duck Brand Softex Bath Mats are machine washable and latex free and are not intended for use on any type of textured or uneven surface, including ceramic tile or pre-textured tubs. Stylish seating with the convenience of a folding bar stool. The Jute Padded Back Folding Stool adds an extra dash of elegance for dining or entertaining. The wood frames feature a classic Padded Back and a wipe clean, jute colored vinyl padded seat with the appearance of leather, and a rich Espresso finish. Front and rear supports provide extra stability. The space saving stool folds for easy set up and storage. No assembly required. 250 pound weight limit. 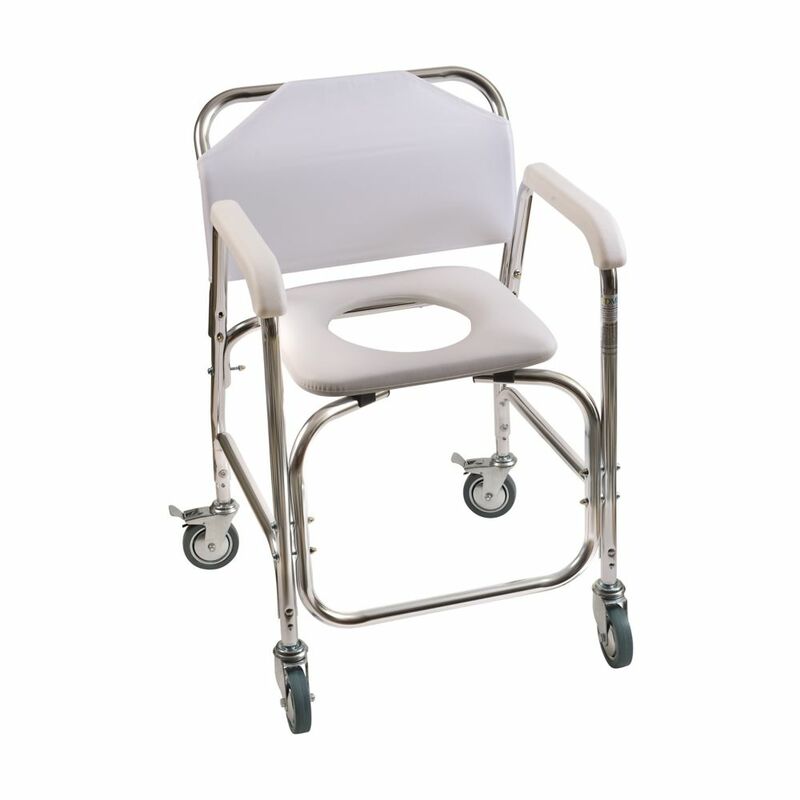 Rolling Shower Transport Chair with Padded Toilet Seat When someone is no longer able to stand in the shower for long, this chair will be a welcome relief. Simply roll them into the shower stall and lock the rear wheels. The padded seat provides more comfort than standard shower chairs and the open area allows for easier bathing. You can also roll the chair over a conventional toilet, which will save you transferring the person over and over. Go straight from the toilet to the shower with minimum effort. The large wheels roll smoothly over floors and carpets.